I love all kinds of book and television characters: heroes, villains, the straight man, the genius, the fool. But what I love more than anything — what makes my little heart go pitter-patter — is a well-rounded, kickass heroine. They’re not always easy to spot, so when I find one I love her immediately, and hard. 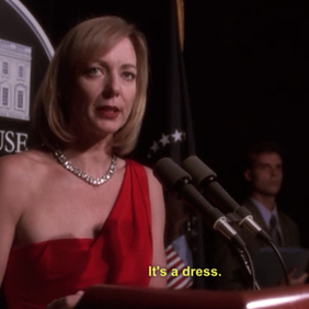 The West Wing finished its prime time run in 2006, and I came across it sometime in 2014 when looking for something to binge watch on Netflix. I had no idea that I was about to meet the love of my life. Claudia Jean (C.J.) 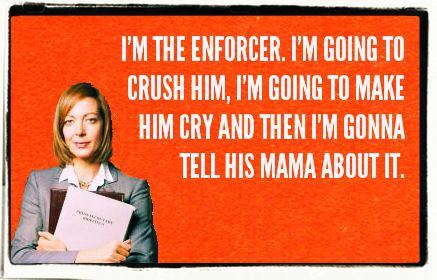 Cregg is everything I aspire to be: strong, confident, independent, funny, and smart. As the White House’s Press Secretary, she’s cool under pressure, knows everything, and is able to explain it in an easy-to-understand way. She’s a good friend, a dedicated feminist, and — my favorite — not afraid to stand up for her beliefs. Her thoughts on the importance of clothing also match mine. And then there’s this gem, which based on my experience seems to be a great metaphor for almost everything at the state and federal levels. In tough or stressful situations, I channel C.J. She’s a badass, and anyone who says otherwise is going to have to answer to me.